PLEASE WAIT FOR THE APPLET TO LOAD. Aquabatics is an emerging technology within the entertainment industry. 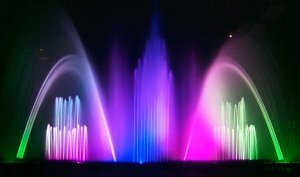 This combination of water, light and sound can provide a spectacular showpiece for your event. The system can be rigged in a variety of combinations making it suitable for both indoor and outdoor use. Straight line stretches or even circular configurations of 20m, up to 100m or more. Sections can be set - up either side of a stage or attraction, yet still operate in perfect symmetry. The patterns produced with the water can be choreographed to any piece of music. 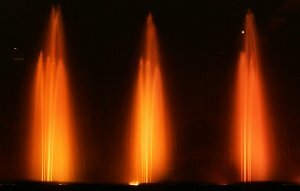 A typical show would contain 50 or more different water configurations, not to mention the countless lighting effects. 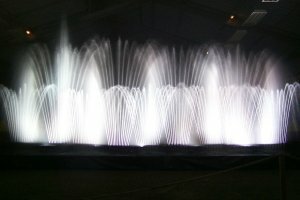 With the addition of a water screen, images such as company logo, photographs, video, message and even special effects, can be projected on to it. Rigging the system is possible in any environment where a relatively flat surface is achievable. Even if your venue is not flat, we can arrange to construct a discreet platform from which to rig the equipment. Grass, concrete, sand, tarmac, brick and stone make good rigging positions for AQUABATICS. AQUABATICS would be the perfect attraction for a shopping centre, carnivals, concerts, corporate launches or promotions, festivals, exhibitions and musical events. The scope is limitless. The value is second to none. Your guests will go home remembering this spectacle. The Price for the spectacular " Aquabatics " show, available in the UK are as follows. 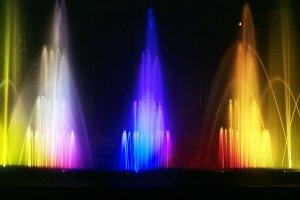 Prices include transport within 100 miles of our offices, operators, fountains, all control systems and lights within the system. Extra day rates apply to consecutive show dates on the same site without the pool being moved or emptied overnight. We can also provide additional lighting effects, generators, lasers, logos and a sound system at additional cost. Prices on application with details of requirements. Special programs designed to your own choice of music and logos for projection onto the water screen are also available on request and at additional cost. We also have special 1m pools which are suitable for reception areas, restaurants, lobby areas, marquees and receptions - Please phone or more information. * These prices do not apply for the periods 4th to 8th November 1999 and 23rd December 1999 to January 2nd 2000. Please phone for a quotation.